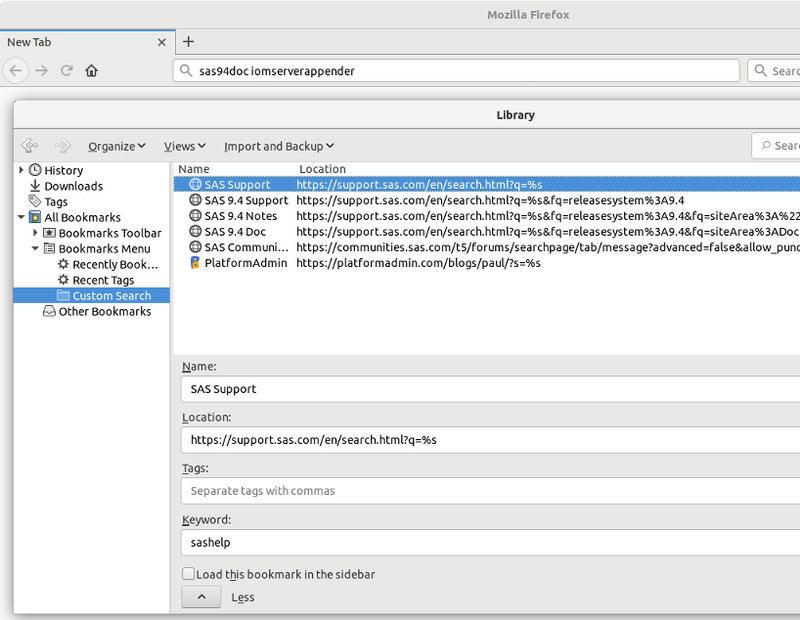 Using these browser features, you can type a keyword (like sas94doc) in the address bar and everything that is typed after it gets sent to the bookmarked search URL as a parameter – you use %s in the URL to indicate where the search query (less keyword) should go. I hope you find these useful too. I know they work in Chrome, Chromium, and Firefox. I have yet to try Internet Explorer or Edge. Please note that some of these may break if SAS Support search is changed in future. If you find they no longer work let me know and I’ll update them as appropriate. Thanks for adding that tip – that’s a great one. I have used it myself from time to time and also found that negating it with a -site:example.com can sometimes come in handy too – like when I remember I saw something, can’t remember exactly where, but know it wasn’t from a large site that might otherwise swamp the results. 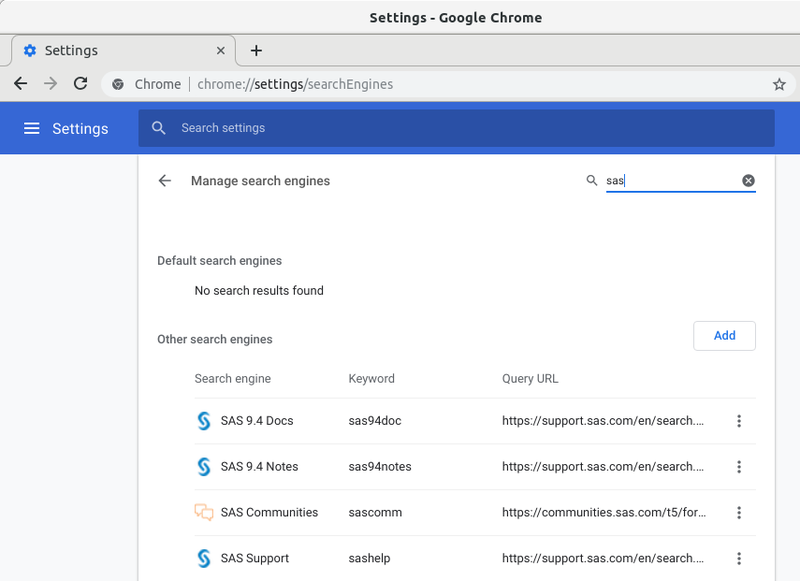 One of the main reasons I switched to using the SAS support search facility is because much of the SAS 9.4 documentation I was looking for (admin and metadata related) did not seem to be indexed by Google – lots of SAS 9.2 and 9.3 but no 9.4. Chris said it was an issue the SAS pubs folk were working to address. As an added bonus I could also use different keyword-bookmark-searches to filter just for doc pages or notes – something I couldn’t do as easily with Google search operators. Thanks much for this tip, Paul. Googling for SAS docs and getting only 9.3 results has been a persistent annoyance. And every time I click on a google link to an old 9.3 doc, I feel like I’m just contributing to the problem by up-voting the 9.3 page ranks. This approach looks very promising. This rocks, Paul – just what I needed today. Thanks for posting! No worries Quentin. Thanks for letting me know you’ve found it useful. Interesting thoughts about the potential for 9.3 doc up-votes. Thanks for the great tips Paul. I find a search term like the one below to also be helpful to limit to only documents from the SAS Support site. Thanks for this Tip Paul. It couldn’t be more frustrating to google a SAS topic and be presented with 2 pages of 9.2 and 9.3 results. I can finally stop cursing at my machine. Thanks for the feedback. Glad to hear you find the tip useful too.